PREPARING GLOBALLY MINDED ACCOUNTING GRADUATES THROUGH MODERN ACCOUNTING CURRICULUM. 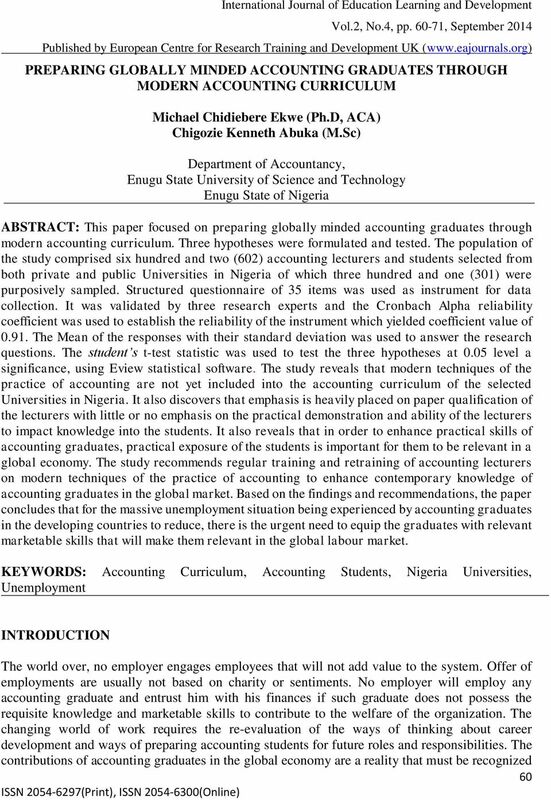 Michael Chidiebere Ekwe (Ph.D, ACA) Chigozie Kenneth Abuka (M.
Download "PREPARING GLOBALLY MINDED ACCOUNTING GRADUATES THROUGH MODERN ACCOUNTING CURRICULUM. Michael Chidiebere Ekwe (Ph.D, ACA) Chigozie Kenneth Abuka (M."
9 strategies will enhance attitudinal competencies of accounting graduates to be relevant in a global economy. Test of Hypotheses The hypotheses that were formulated for the study were tested using the t-test statistical analysis. The hypotheses were tested at 0.0 level of significance. 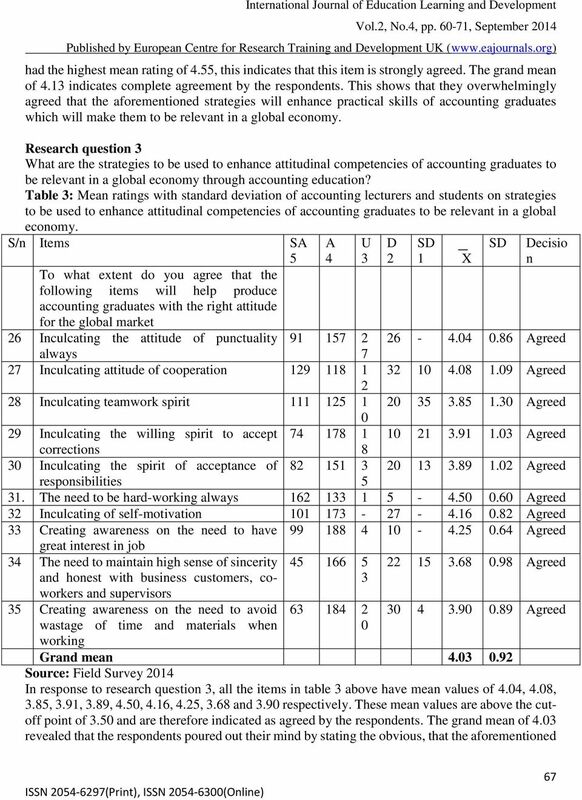 Hypothesis one There is no significant difference between the mean responses of office workers and accounting education teachers on the strategies to be used to enhance contemporary knowledge of Accounting graduates to be relevant in a global economy through accounting education. 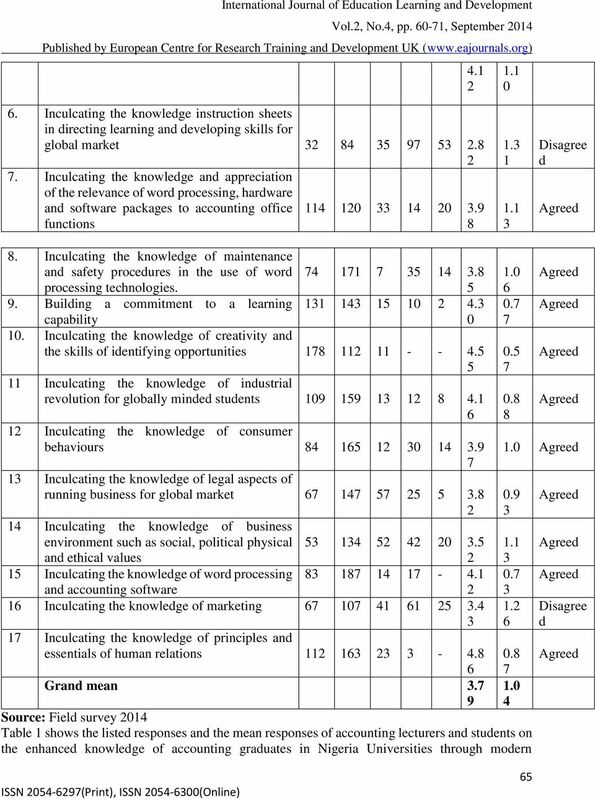 Table : t-test analysis of strategies to be used to enhance contemporary knowledge Groups No of cases X SD df t-cal t- Decision table Office workers Reject H0 Accounting education teachers Source: Researcher s EView.0 Computation Results in table reveals that the calculated t-value of 10. is greater than the critical t-value of 1.9 at 0.0 level of significance. The null hypothesis is rejected. 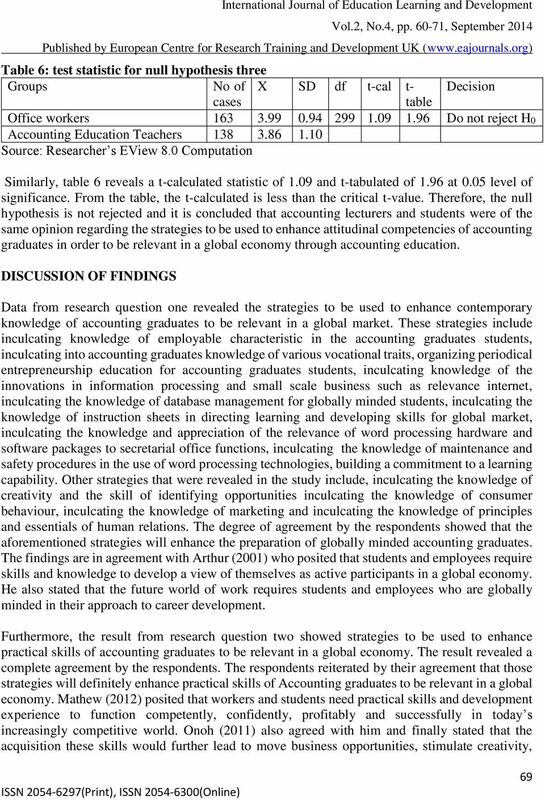 Therefore, the researchers did not uphold the null hypothesis and concluded that significant difference exists between the opinions of office workers and accounting education teachers on the strategies to be used to enhance contemporary knowledge of Accounting graduates to be relevant in a global economy through accounting education. 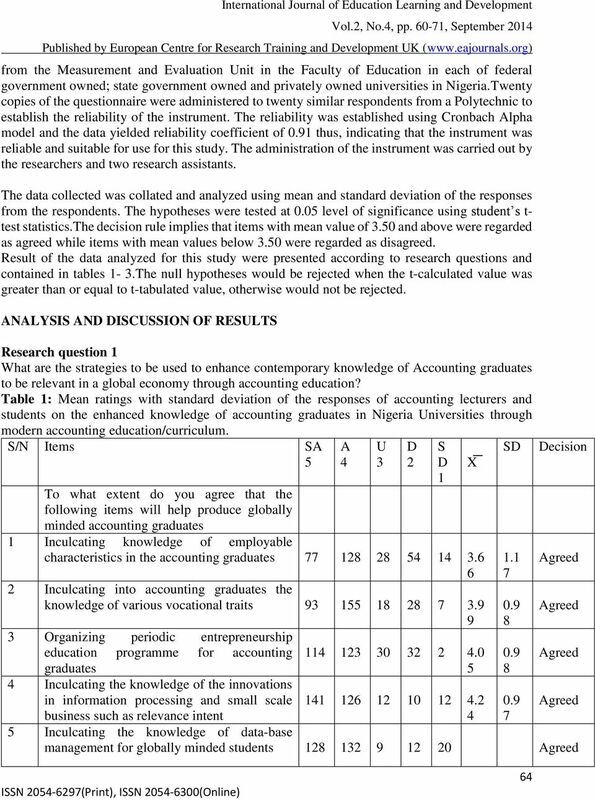 Hypothesis two There is no significant difference between the mean responses of office workers and accounting education teachers on the strategies to be used to enhance practical skills of Accounting graduates to be relevant in a global economy through accounting education. Table : t test statistic for null hypothesis two Groups No of X SD df t-cal t- Decision cases table Office workers Do not reject H0 Accounting Education Teachers Source: Researcher s EView.0 Computation There is no reason for rejecting the H0 since the t-calculated (0.) is less that t-table which is 1.9 at 0.0 level of significance. 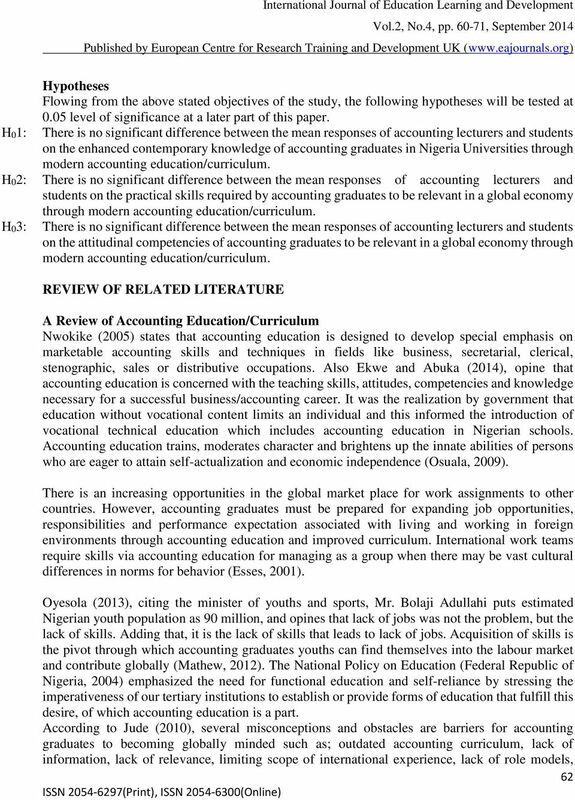 Therefore, we uphold the H0; with the conclusion that there is no significant difference between the opinions of office workers and accounting education teachers on the strategies to be used to enhance practical skills of Accounting graduates to be relevant in a global economy through accounting education. 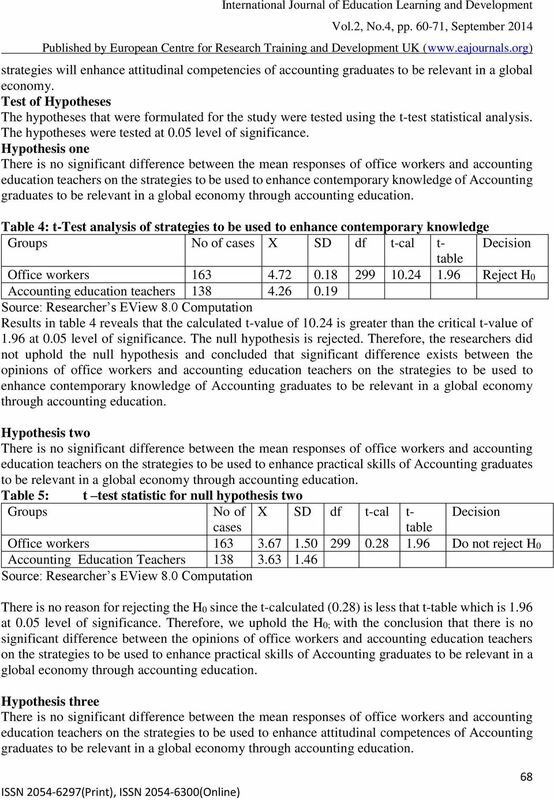 Hypothesis three There is no significant difference between the mean responses of office workers and accounting education teachers on the strategies to be used to enhance attitudinal competences of Accounting graduates to be relevant in a global economy through accounting education. 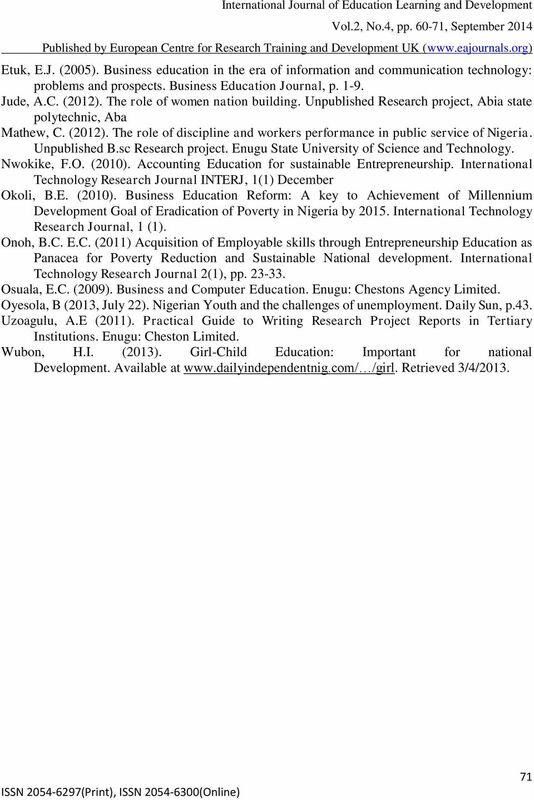 International Journal of Scientific and Research Publications, Volume 4, Issue 7, July 2014 1 Assessment of Workshop Facilities Management Practices in Technical Colleges of Niger State Abdulkadir, M.
Amiaya, Anita Ogheneovo Department of Office Technology and Management, Delta State Polytechnic, P. M. B. 05, Ozoro, Delta State, Nigeria. Graduate Turnout and Graduate Employment in Nigeria AKINYEMI SAMUEL, PhD, AIMM OFEM, IGOT BASSEY, PhD IKUENOMORE SAMUEL O., M.ED Department of Educational Management Lagos State University Lagos, Nigeria. FUNCTIONAL VOCATIONAL AND TECHNICAL EDUCATION CURRICULUM FOR SUSTAINABLE YOUTH EMPOWERMENT IN NIGERIA. UMUNADI, Ejiwoke Kennedy Ph. Global Journal of HUMANSOCIAL SCIENCE: G Linguistics & Education Volume 14 Issue 7 Version 1.0 Year 2014 Type: Double Blind Peer Reviewed International Research Journal Publisher: Global Journals Inc.